This Corp of Engineers park is located off of Rocky Lane in Acworth. Galt's Ferry is larger than many of the Corps day use parks. 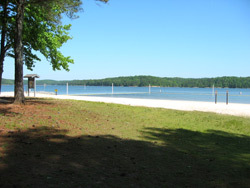 It can be a busy place in the summer, in part because of the large beach and also because of its location on the south side of Allatoona Lake. There is a large swimming beach, individual picnic tables, a three lane boat ramp, a fishing jetty and group picnic facility found in the park. Just as with all of the Corps parks with a beach and boat ramp, there is a $4 day use fee to use the park. Galt's Ferry is open daily from 8 AM to 9 PM. There are a few bathrooms in the park. 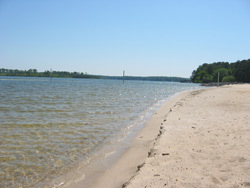 Swimming Beach - The swimming beach leads into a roped off area of the lake. The deepest part of the water in the swimming area is 6 feet deep. 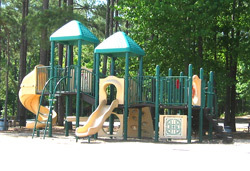 At the back of the beach is a playground with a playscape. There are no glass bottles or pets allowed on the beach. Boat Ramp / Fishing Jetty - The boat ramp has three large lanes. 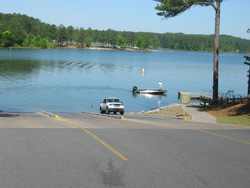 There are pull through parking spaces in the boat launch parking area, which is seperate from the parking area that serves the swimming beach and picnic facility. The fishing jetty is adjacent to the swimming beach. It is a raised structure that extends a short distance into the lake. 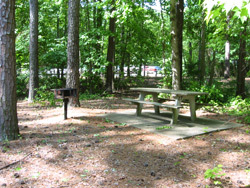 Picnic Facilities - There are individual picnic tables scattered around different areas of the park. Each table has a family sized barbeque grille nearby. 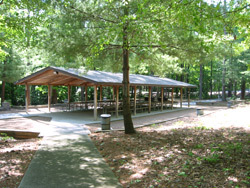 There is also a large group picnic facility, consisting of a large covered pavilion and two large grilles. The pavilion can be reserved for $125 and can comfortably handle up to 75 people. Call 678-721-6700 for reservations. Two views of the swimming are at Galt's Ferry. One of the many picnic tables and barbeque grills in the park, and a photo of the playscape that is found at the back of the swimming beach. 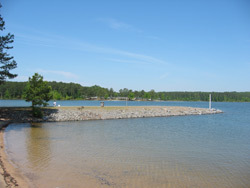 Boat ramp access to Lake Allatoona, and a view of the fishing jetty in Galt's Ferry park. 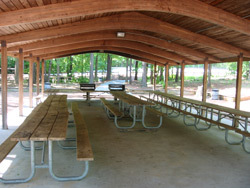 The group picnic pavilion. This facility is available for a fee of $50 - reservations are required.